O.B.jewelry Co.,Ltd is a professional manufacturer, wholesaler as well as exporter of fashion jewelry in China. It was established by our president and CEO, an experienced designer in the jewelry field. And our factory located in the Chang An Town of Dongguan, Guangdong Province , PRC. Located an hour between Shenzhen and Guangzhou, two international airports and two major shipping ports. The greatest advantage in convenient transportation are enjoyable.Now we have about 300 experienced staffs in factory, and monthly production with more than 150000 pieces. And we have produced various selections of jewelry including fashionable European style rings, pendants & earrings to elegant tennis necklaces, bracelets, bangles, cufflinks and brooches etc. Our product has its market to all of the world, mostly to Europe and US, middle east now. And almost of our samples are exhibit in our showroom. Our main products are made in 925 sterling silver, brass or stainless steel set with high quality Cubic Zirconia or some others semi-precious stones etc in quality Rhodium / gold plating......, the whole process including designing, molding, waxing, casting, polishing, stone setting, plating and packing are finished in our own factory, so the quality can be controlled very well during productions. 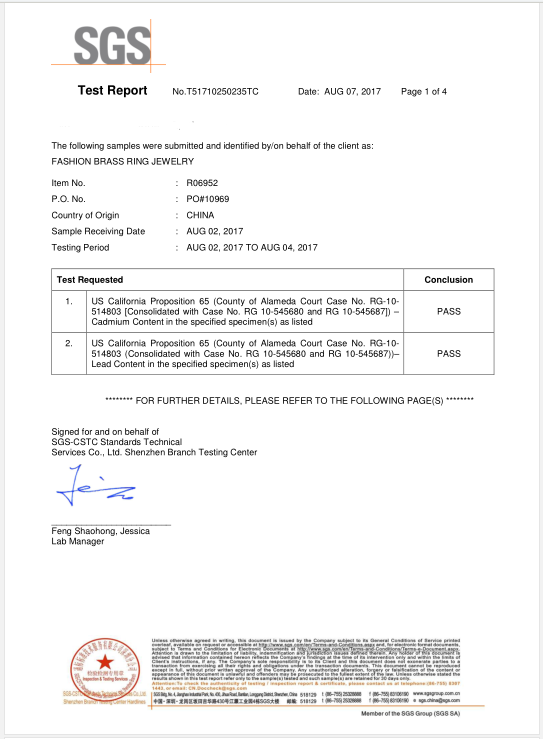 Our company principle is "quality and customers first", based on this, we always promise the most unique and value products, prompt delivery, by constantly improving innovation and customer service, O.B.Jewelry will continue to be the gold standard in the field of fashion jewelry. We look forward to be your sincere and reliable partner. 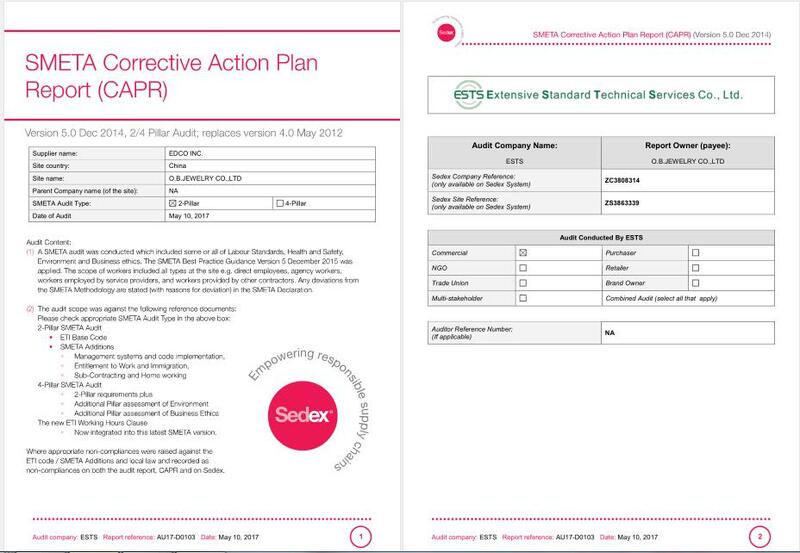 A SMETA (Sedex) Audit was conducted which included some or all of Labour Standards, Health and Safety, Environment and Business ethics. 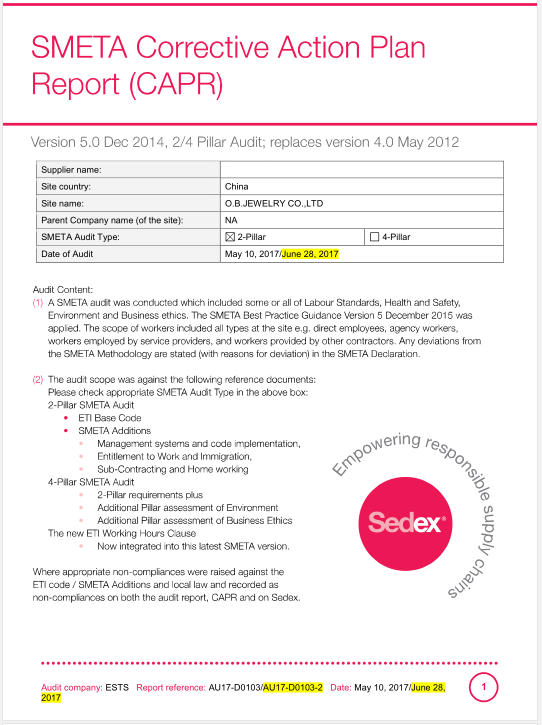 The SMETA Best Practice Guidance Version 5 December 2015 was applied. The scope of workers included all types at the site e.g. diret employees, agency workers, workers employed by service providers, and workers provided by others contractors. Any deviations from the SMETA Methodology are stated(with reasons for deviation) in the SMETA Declaration.